Solar activity is an intimate part of the Holy Cross Cycle, and the planetary and lunar cycles that create the unfoldment of human consciousness. Solar flares affect the Central Nervous System (stomach lining), all brain activity (including equilibrium), all human and animal behavior and all psychophysiological (mental-emotional-physical) response. Solar flares can casuse us to be nervous, anxious, worrisome, jittery, irritable, lethargic, have short term memory loss, feel nauseous, queasy, have prolonged head pressure or head aches, have trouble with the radio, phone, Internet, computers, and all forms of communication--both human and technological. Solar activity, although dramatic, catalyzes, and is essential for super-human achievement by stimulating radical change and transformation in the organizational foundation of matter, energy and consciousness. The Solar activity occurring now is an intimate part of the dynamic catalyzing the Holy Cross evolutionary spiritual shift. Solar flare activity and Super Nova (star) explosions are the primary catalysts that stimulate a renaissance in consciousness. They provide the cosmic radiation that supports the evolutionary unfoldment and maturation of the incarnate soul--the illumination of consciousness that we all seek. The Yellow Book is an amazing "space-time storage device" that projects all of earth's, HU-man history, there are many "devices" that hold the history of many alien "projects"
All we have learned of psychotherapy suggests that it is at the precise time when the individual feels as if hir whole life is crashing down around hir, that hir is most likely to achieve an inner reorganisation constituting a quantum leap in hir growth toward maturity. Our hope, our belief, is that it is precisely when society's future seems so beleaguered – when its problems seem almost staggering in complexity, when so many individuals seem alienated, and so many values seem to have deteriorated – that it is most likely to achieve a metamorphosis in society's growth toward maturity, toward more truly enhancing and fulfilling the human spirit than ever before. Thus we envision the possibility of an evolutionary leap to a trans-industrial society that not only has know-how, but also a deep inner knowledge of what is worth doing." Dec. 3, 2003: Earth is surrounded by a magnetic force field--a bubble in space called "the magnetosphere" tens of thousands of miles wide. Although many people don't know it exists, the magnetosphere is familiar. It's a far flung part of the same planetary magnetic field that deflects compass needles here on Earth's surface. And it's important. The magnetosphere acts as a shield that protects us from solar storms. According to new observations, however, from NASA's IMAGE spacecraft and the joint NASA/European Space Agency Cluster satellites, immense cracks sometimes develop in Earth's magnetosphere and remain open for hours. This allows the solar wind to gush through and power stormy space weather. Welcome to the TrueMajority Action Center! Our goal is to make working for justice and a sustainable world fast, free, and sometimes even fun. By working together we will make a difference. Bill Cooke of the Space Environments Group at the NASA Marshall Space Flight Center explains: "Normally there's just one Leonid meteor shower each year, but this year we're going to have two: one on Nov. 13th and another on Nov. 19th." Both are caused by comet Tempel-Tuttle, which swings through the inner solar system every 33 years. With each visit the comet leaves behind a trail of dusty debris--the stuff of meteor showers. Lots of the comet's old dusty trails litter the mid-November part of Earth's orbit. Giant sunspot 486 unleashed another intense solar flare on Nov. 4th (1950 UT), and this one could be historic. The blast saturated X-ray sensors onboard GOES satellites. The last time this happened, in April 2001, the flare that saturated the sensors was classified as an X20--the biggest ever recorded at the time. Yesterday's flare appears to have been even stronger. Here comes the sun. Again and again and again. Just days after two monster solar hurricanes sped toward Earth, the sun lobbed a trio of solar flares into interplanetary space on Monday. These latest flares carried enough electrically charged particles to cause concern for some satellite operators on Earth, but are likely to have less impact on our planet than last week's huge solar storms. That is because the storms that hit Earth last Wednesday and Thursday, some of the most intense ever detected, were aimed right at our planet. One of the largest solar eruptions in history is sending a giant electromagnetic pulse our way at speeds of millions of miles per hour. Due to hit Earth any time from now, scientists say it could trigger worldwide outages in power grids and communication networks—and spectacular auroral lights in the night skies. The giant blast from the sun was observed through telescopes yesterday morning. More powerful than a billion hydrogen bombs, it is sending a super-heated ball of electrified gas (known as a coronal mass ejection, or CME) straight towards us. The fireball that signalled the event was estimated to be 30 times wider than Earth. One of the most powerful solar flares in years erupted from giant sunspot 486 this morning at approximately 1110 UT. The blast measured X17 on the Richter scale of solar flares. As a result of the explosion, a strong S3-class solar radiation storm is underway The explosion hurled a coronal mass ejection (CME) directly toward Earth. Bright auroras could appear when the fast-moving cloud sweeps past our planet-- perhaps as early as tonight. A geomagnetic storm spawned by a giant eruption of gas on the sun barreled toward Earth on Friday, interfering with high frequency airline communications but causing no major problems, federal officials said. The storm was expected to be most severe Friday, though experts said they didn't anticipate problems with communication networks. "This is not a super solar storm," said Larry Combs, a space weather forecaster with the National Oceanic and Atmospheric Administration's Space Environment Center in Boulder. So far, the storm has interfered with airline communications and radio communications for teams on Mount Everest (news - web sites), Combs said. But problems were not widespread. 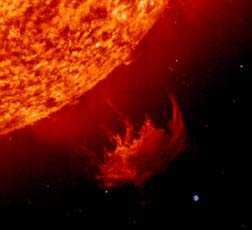 The storm, called a "coronal mass ejection," is a mass of solar gas that swept toward Earth at 2 million mph. The usual cycle for such a storm is every 11 years; this one was expected to hit three years ago. "It is kind of like a snowstorm in June in Colorado," Combs said. Combs said power companies, which are among the center's best customers, have been notified and were taking precautions to avoid voltage problems and blackouts. China on Saturday announced plans to launch a satellite to monitor the Earth but made no mention of its top-secret first manned space flight expected any day now. The music of a black hole is generated in the region just outside the black hole proper, where incoming matter is accelerated to near-the-speed-of-light just before being swallowed. 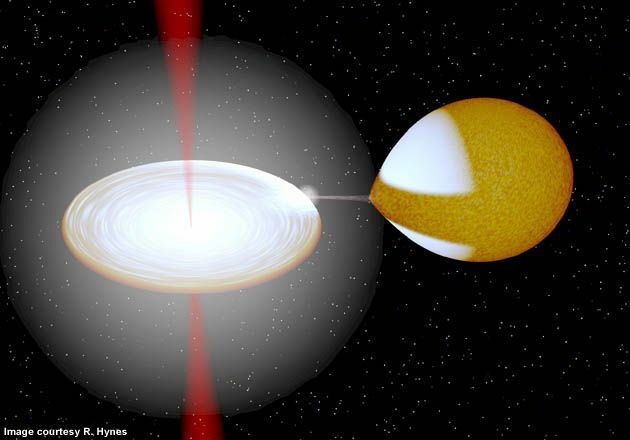 The notes and pauses are roughly the same in faraway supermassive black holes, which can weigh more than a billion stars, as they are in comparatively puny stellar black holes, which are typically just a few times as massive as the Sun and are found here in our own galaxy. MARS: Today (Aug. 30th) Mars is at perihelion, the end of its lopsided orbit closest to the sun (1.38 AU), which means the sun is beating down on the red planet with unusual intensity. Perihelion marks the beginning of dust storm season on Mars. Why? Sun-warmed air moves. The wind picks up dust. And on Mars small clouds of dust sometimes expand and envelop the whole planet. These clouds are something for amateur astronomers to look for while they're watching Mars with their telescopes during the weeks ahead. 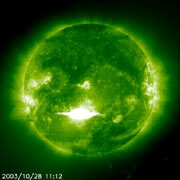 AURORA OUTLOOK: Earth is heading for a solar wind stream flowing from a coronal hole on the sun. Our first encounter with the stream could take place on Sept. 2nd, so that's when sky watchers should be alert for possible auroras. MASSIVE - FAST! Power outage hits LONDON! To Power wars Update page. MASSIVE - FAST! Power outage hits NE USA! Failure in Canada causes TEN Nuke Plants to shut down. Hundreds of thousands of people poured onto the streets of New York as office blocks and other buildings emptied following a massive power cut. Outages were also reported in Detroit, Ottawa and Toronto. New York Mayor Michael Bloomberg said however there was no evidence of a terrorist attack. All shops shut and Grand Central station was evacuated and all subway stations were closed. Main roads in the city were choked with cars and people as commuters tried to walk home. But traffic lights were also out of action adding to the traffic chaos. Large swathes of Detroit and Cleveland lost their power shortly after 4:00 pm (2000 GMT). "The first inkling we had was when the power went out in our building," said Len Singer, a spokesman for the Detroit utility, Detroit Edison, speaking from the company's headquarters in downtown Detroit. Singer said the company was investigating numerous reports of blackouts. "It's too early to get a handle on it just yet," he said. In the Detroit suburb of Grosse Pointe Park, Detroit resident Janet Braunstein was taking an afternoon nap when she noticed that everything had gone quiet. "The radio went off, the air conditioners and ceiling fans stopped," she said. "I'd head out to a pool to cool off," she added, "but I can't leave my two dogs here on their own." Sky watchers should be alert for auroras after nightfall on August 6th when Earth could encounter a solar wind stream flowing from a coronal hole on the sun. Bush goes on month long vacation: Hiding from Mars retrograde: Karmic reality : The shifting red sands! Earth and Mars will soon be 56 million km apart--a small distance by interplanetary standards and the nearest they've been in some 60,000 years. Closest approach happens on August 27th, but Mars is already an unbelievable sight. The planet can be seen in the southern sky between 10 p.m. and dawn--a brilliant red star outshining everything around it. Contactee, experiencer, and participant are all terms describing an abductee. However, abductee is the term most recognized by the public. As abductees learn more about their abduction experiences, many prefer to be called contactees, experiencers, or participants. This shift in terminology often reflects the abductees' change in attitude from fear to acceptance. They accept it because they feel they cannot change the phenomena. They are a product of it and will live with its effects. Or, they may feel compelled to learn more about their abduction experience by meeting with other abductees and working with researchers. Sunspot 375 has grown impressively during the past 24 hours. It now stretches nearly 10 Earth-diameters from side to side and has developed a twisted "beta-gamma-delta" magnetic field, which poses a threat for X-class solar flares. Any explosions from its vicinity during the next few days would likely be Earth-directed. This large spot is easy to see, but never stare at the sun! Use safe solar projection techniques described at spaceweather.com. Sky watchers in North and South America will be favored for a copper-colored lunar eclipse on May 15/16, 2003. Sky watchers in the Americas, Europe, Africa and parts of Asia can see a sunset-red lunar eclipse tonight, May 15th and 16th. Today's edition of spaceweather.com describes a few more things that will appear in the sky around the time of the eclipse: Iridium flares and a transit of the Moon by the International Space Station. IRIDIUM FLARES: Sky watchers in the western and central United States are favored to see some pleasing Iridium flares during tonight's lunar eclipse. "Some cities that will have decent flares are Phoenix, Salt Lake City, El Paso, Minneapolis, Omaha and Missoula," says space scientist Rob Matson of SAIC, who also forecasts Iridium flares for the International Space Station. Most of tonight's flares will appear higher in the sky than the moon. "With a wide field of view camera, however, it may be possible to capture a flare and the moon in the same field of view," notes Matson. SPACE STATION TRANSIT: This is for advanced observers. Along a narrow path stretching from Dallas through St. Louis to Chicago, sky watchers can see the International Space Station pass in front of the eclipsed moon tonight. Like the moon itself, the ISS will be inside Earth's shadow, so it will be dark--a ghostly silhouette racing across the dimly-lit lunar terrain in less than a second. You have to be at the right place at the right time to see it. Forecaster Thomas Fly has prepared maps and timetables for the central United States and other places where these transits may be visible. ** Also of note: Matrix II debuts today...not surprisingly coinciding with the lunar eclipse... folks are talking about the eclipse/date being linked to Planet X (or Nibru) coming back into the neighborhood...hmmm. BAGHDAD, Iraq - A U.S.-held weapons cache laden with 80 Iraqi missiles exploded on the edge of Baghdad, killing six people and pummeling homes for miles (kilometers) around with a cascade of warheads, rockets and mortars. The U.S. military blamed unknown attackers who they said fired four flares into the sprawling open missile dump. But hundreds of enraged, screaming Iraqis blamed Iraq (news - web sites)'s new American overseers. "This is the safety that Bush promised us?" demanded Munthir Safir, the blood of his family dried on the cloth of his white caftan. Around him, wailing women collapsed over the coffins of two adults and four teenagers. "No Saddam! No Bush! Yes to Islam!" fist-waving men shouted. The disaster touched off protests in the stricken Zafaraniyah neighborhood and in the city center. Hours later, smoke still surged from the blackened crater left at the missile cache. Explosives boomed, a rocket whistled and rounds popped. One unexploded missile protruded from a lawn. U.S. forces promised to send removal experts. One American soldier suffered a broken arm in the initial attack on the depot, said Col. John Peabody, commander of U.S. Army's 11th Engineering Brigade. He was not immediately identified. In Qatar, U.S. Central Command spokesman Lt. Mark Kitchens placed blame squarely on what he called "the despicable people" who allegedly fired the flares. "This is not just an attempt to disrupt the process of peace. It's a crime against the Iraqi people," Kitchens said. Elsewhere on Saturday, U.S. soldiers found 14 suspicious barrels, including one that preliminary tests found could contain a mixture of nerve and blistering agents, according to ABC News. The barrels were found about 25 miles north of Saddam Hussein (news - web sites)'s home region of Tikrit in a large weapons storage area that included missiles and missile parts. ABC was escorted to the site by the U.S. military. Previous finds of chemicals suspected of being weapons of mass destruction have turned out to be false alarms. The Pentagon (news - web sites) said it was aware of the report but could not confirm it. The disaster in Baghdad struck at 7:50 a.m. as residents slept or assembled bread and tea for breakfast. Out of sight of U.S. troops at the depot, someone fired four flares over a wall around an open field where ordnance had been stored, said Sgt. 1st Class Ronald King, a witness. Americans said some of the tactical weapons had been stored there by Saddam's regime, which had stashed such items in schools, homes and other populated areas. The U.S. military had put some of the ordnance there itself, however, collecting abandoned Iraqi caches from around the city for later disposal, King said. The cache included Russian-made Frog-7s and Iraq's own Al Samoud 2 — 80 missiles in all, said Col. John Peabody, commanding officer of the U.S. Army's 11th Engineering Brigade, which had been helping at the site. The flares hit an ammunition pit, setting fire to wooden ammo crates, King said. In a flash, deadly remnants of Saddam's regime were pounding homes without warning. Booms rattled windows across the city. About a mile away, a missile plowed into a dirt lane between two rows of crude two-story homes. Walls crumbled and roofs blew off, demolishing four houses. Inside one, the impact killed a 50-year-old worker, his four teenage children and his 23-year-old daughter-in-law, a new mother. "Our house collapsed. That's all I remember," Mohammed Khazaal, 15, said from a hospital bed, his head wrapped in bandages and gashes across his body. 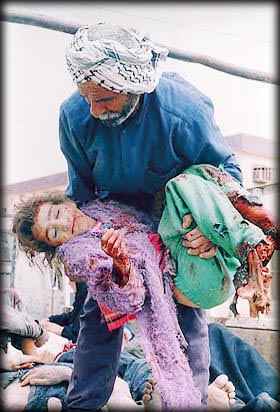 A brother of the dead young woman, he had been sleeping when the missile hit. Nearby, medical workers treated deep cuts in the legs of Zeineb Thamer, the year-old daughter of the woman who died. Blood matted Zeineb's light-brown hair. In English, the message on her T-shirt declared, "Welcome, Little Friend." Peabody said 10 or more Iraqis were wounded. Two of them were said to be near death. U.S. forces initially came under small-arms fire when they went to the scene, Peabody said. They returned fire. There was no word on further casualties. Peabody wouldn't speculate on exactly who fired the flares. "Somebody who does not want us to be here," he said. Ultimately, Peabody said, the fallen Iraqi regime was responsible. "We are very sorry that the practice of Saddam Hussein putting his missiles ... throughout Baghdad has resulted in this." In Zafaraniyah, residents described days of what appeared to be U.S.-controlled blasts at the missile dump, apparently to destroy leftover Iraqi weaponry. Mohammed Hussein said he and some neighbors had personally visited U.S. military officers to stress that the depot was near crowded neighborhoods. American forces stopped night explosions after that, and ended the daytime ones three or four days ago, Hussein and others said. 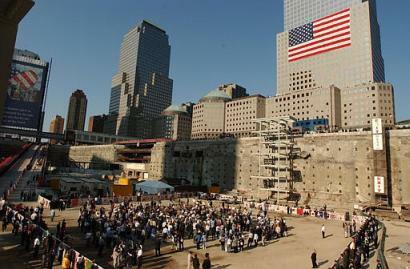 Many Iraqis in the area, though, contended that an intentional American blast had triggered the disaster. "Why?" one distraught man demanded when three American GIs went to look for missile parts in the shattered home. Responded one American: "It's not our fault." Who Beget our future daughters. Is held in the way she loves upon us. We kill our daughters and wave our flags. I Ponder, Who are the evil doers? As Mothers scream in fear. As sand covers the dead. Will the sand grow another daughter? Will the sand give her smile back to us? She is gone now, gone forever. Another daughter into the sand. I see where my daughter is playing. And my daughter, are different? We are ALL daughters of the divine. Is it too much to ask for might not to be right? Really solve the problem of savages salivating greed? My tears drop upon the sand. Against all odds, there were enough signatures, e-mails, telegrams, and phone calls within the last 24 hours to Rep. Dennis J. Kucinich of Ohio to persuade him to introduce before the House of Representatives a little-known resolution that deprives the President of his authority to wage war, by returning war powers to Congress. However, we must now persuade Speaker of the House Dennis Hastert that there is a growing consensus, if not a plurality, to mandate the resolution for a House ballot. Therefore, please take a moment to e-mail Speaker Hastert, simply saying, "I am in favor of introducing HJ Resolution 20 for a vote." And then please follow up congress people and senators. Always include your address or they will disregard the email. Millions of protesters — many of them marching in the capitals of America's traditional allies — demonstrated Saturday against possible U.S. plans to attack Iraq. In a global outpouring of anti-war sentiment, Rome claimed the biggest turnout — 1 million according to police, while organizers claimed three times that figure. In London, at least 750,000 people demonstrated in what police called the city's largest demonstration ever. In Spain, several million people turned out at anti-war rallies in about 55 cities and towns across the country, with more than 500,000 each attending rallies in Madrid and Barcelona. Spanish police gauged the Madrid turnout at 660,000. Organizers claimed nearly 2 million people gathered across the nation in one of the biggest demonstrations since the 1975 death of dictator Gen. Francisco Franco (news - web sites). More than 70,000 people marched in Amsterdam in the largest Netherlands demonstration since anti-nuclear rallies of the 1980s. Berlin had up to half-a-million people on the streets, and Paris was estimated to have had about 100,000. In New York, rally organizers estimated the crowd at up to 500,000 people. City police provided no estimate of the crowd, which stretched 20 blocks deep and two blocks wide. "Peace! Peace! Peace!" Archbishop Desmond Tutu of South Africa said while leading an ecumenical service near U.N. headquarters. "Let America listen to the rest of the world — and the rest of the world is saying, 'Give the inspectors time.'" London's marchers hoped — in the words of keynote speaker the Rev. Jesse Jackson (news - web sites) — to "turn up the heat" on Prime Minister Tony Blair (news - web sites), President Bush (news - web sites)'s staunchest European ally for his tough Iraq policy. Rome protesters showed their disagreement with Prime Minister Silvio Berlusconi's support for Bush, while demonstrators in Paris and Berlin backed the skeptical stances of their governments. "What I would say to Mr. Blair is stop toadying up to the Americans and listen to your own people, us, for once," said Elsie Hinks, 77, who marched in London with her husband, Sidney, a retired Church of England priest. Tommaso Palladini, 56, who traveled from Milan to Rome, said, "You don't fight terrorism with a preventive war. You fight terrorism by creating more justice in the world." Several dozen marchers from Genoa held up pictures of Iraqi artists. "We're carrying these photos to show the other face of the Iraqi people that the TV doesn't show," said Giovanna Marenzana, 38. Some leaders in German Chancellor Gerhard Schroeder's government participated in the Berlin protest, which turned the tree-lined boulevard between the Brandenburg Gate and the 19th-century Victory Column into a sea of banners, balloons emblazoned with "No war in Iraq" and demonstrators swaying to live music. Police estimated the crowd at between 300,000 and 500,000. "We Germans in particular have a duty to do everything to ensure that war — above all a war of aggression — never again becomes a legitimate means of policy," shouted Friedrich Schorlemmer, a Lutheran pastor and former East German pro-democracy activist. In the Paris crowd at the Place Denfert-Rochereau, a large American flag bore the black inscription, "Leave us alone." Gerald Lenoir, 41, of Berkeley, Calif., came to Paris to support demonstrators. "I am here to protest my government's aggression against Iraq," he said. "Iraq does not pose a security threat to the United States and there are no links with al-Qaida." In southern France, about 10,000 people demonstrated in Toulouse against the United States, chanting: "They bomb, they exploit, they pollute, enough of this barbarity." Police estimated that 60,000 turned out in Oslo, Norway; 50,000 in bitter cold in Brussels, Belgium; and about 35,000 in frigid Stockholm, Sweden. About 80,000 marched in Dublin, Irish police said. Crowds were estimated at 60,000 in Seville, Spain; 40,000 in Bern, Switzerland; 30,000 in Glasgow, Scotland; 25,000 in Copenhagen, Denmark; 15,000 in Vienna, Austria; more than 20,000 in Montreal and 15,000 in Toronto; 5,000 in Cape Town and 4,000 in Johannesburg in South Africa; 5,000 in Tokyo; and 2,000 in Dhaka, Bangladesh. "War is not a solution, war is a problem," Czech philosopher Erazim Kohak told about 500 people in Prague, the Czech Republic. In Mexico City, as many as 10,000 people — including Nobel Peace Prize laureate Rigoberta Menchu — snarled traffic for blocks before rallying near the heavily guarded U.S. Embassy. Demonstrators beat drums, clutched white balloons and waved handmade signs saying, "War No, Peace Yes." In Baghdad, tens of thousands of Iraqis, many carrying Kalashnikov assault rifles, demonstrated to support leader Saddam Hussein (news - web sites) and denounce the United States. "Our swords are out of their sheaths, ready for battle," read one of hundreds of banners carried by marchers along Palestine Street, a broad Baghdad avenue. In Damascus, the capital of neighboring Syria, an estimated 200,000 protesters chanted anti-U.S. and anti-Israeli slogans while marching to the People's Assembly. Najjah Attar, a former Syrian cabinet minister, accused Washington of attempting to change the region's map. "The U.S. wants to encroach upon our own norms, concepts and principles," she said in Damascus. "They are reminding us of the Nazi and fascist times." An estimated 2,000 Israelis and Palestinians marched together against war in Tel Aviv on Saturday night. In Ukraine, some 2,000 people rallied in snowy Kiev's central square. Anti-globalists led a peaceful "Rock Against War" protest joined by communists, socialists, Kurds and pacifists. "We want to say that war is evil and that we who survived one know that better than anyone," said Majda Hadzic, 54. In divided Cyprus, about 500 Greeks and Turks braved heavy rain to briefly block a British air base runway. — "NATO (news - web sites), U.S. and EU equals War"
— before heading toward the U.S. Embassy. U.S. Ambassador Thomas Miller said the Greek protesters' indignation was misplaced. "They should be demonstrating outside the Iraqi embassy," he said before the march. About 900 Puerto Ricans chanted anti-war slogans against the possible invasion of Iraq. One man waved a U.S. flag on which the stars were replaced with skulls. In Brazil, President Luiz Inacio Lula da Silva began efforts to unite South American nations against a possible U.S.-led attack on Iraq. Police estimated 1,500 marchers. BUSH EGO "GROWING FASTER THAN ECONOMY"
"Bush's ego seems to be growing much faster than the economy. Notice that he more and more uses the personal pronoun - "I" am sick and tired, he says, and "I" have no desire to watch the rerun of an old movie. This is an emperor talking, not the president of a republic. The relationship between two sovereign nations is not a matter of personalities. Bush's personal feelings and prejudices are not the basis on which U.S. government policy should be formulated. Bush doesn't seem to take criticism very well, and he tends to resort to name-calling when world leaders disagree with him, as if mere disagreement were a mortal sin. Well, Saddam Hussein is no Hitler; George Bush is no Winston Churchill. And this war will definitely not be our finest hour." All that is necessary for the triumph of evil is that Americans remain ignorant, greedy and fearful of their neighbors. Wake up America before it's too Late! Columbia Explodes over Dallas, and drops "Exotic Materials" over Palestine Texas. A senior law enforcement official, also speaking on condition of anonymity, said there had been some intelligence that raised concerns about a previously scheduled flight of Columbia, which was to have carried the same crew. 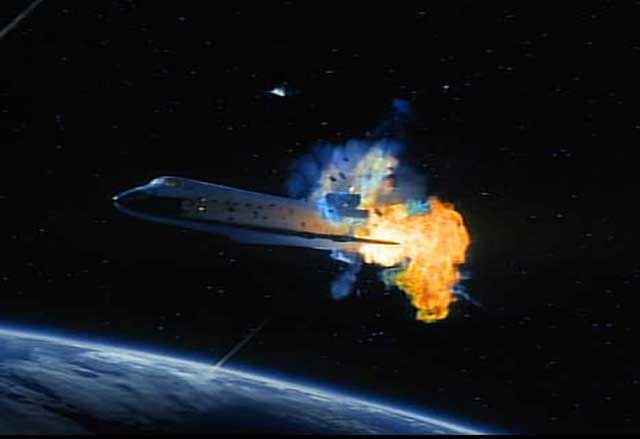 The intelligence, related to Israeli astronaut Ilan Ramon, was termed not credible, but the flight was postponed for other reasons. There had been no troubling intelligence regarding this flight, officials said, and they do not believe terrorism was involved. Columbia crew was on (SSM) "Special Scientific Mission" and may have been involved in "Top secret technology" watched by Military advisor Astronaut cammander Ramon. Nothing could have caused it. Nothing could have prevented it.